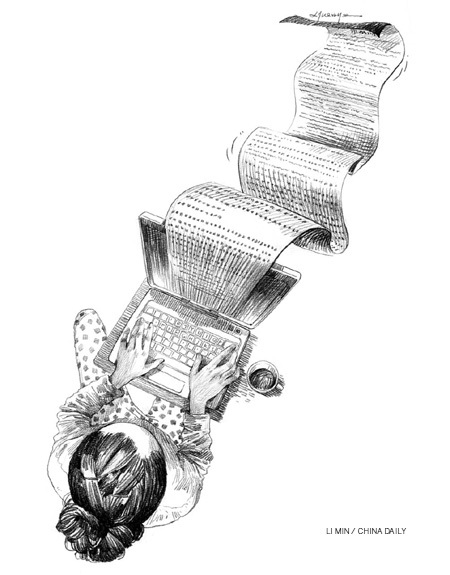 Surge in users helps plot a new chapter for online reading, Jiang Xueqing and Lian Mo report in Beijing. Many readers said they are happy to pay for Web novels. The price is low and they believe the writers deserve the money. Sun Xuebin, a 26-year-old computer engineer who works in Beijing, has been reading novels online since 2003. One of his favorites is The New Song Dynasty, a popular historical fantasy published on Hjsm.tom.com. He paid 50 yuan for more than 200 chapters. "It's not a big deal," he said. "The cost is reasonable and the author is serious about his story. He writes precisely and provides the readers with rich information. It helps to enlarge my knowledge of history. I think a potential writer like him should be encouraged to produce better works." Ma Li, who works for a daily newspaper in Fujian province, has been reading Web novels on her computer and mobile phone for more than 10 years. She likes romance novels and alternative history fantasies, for they are so casual in style that she feels no pressure at all while reading. She started paying for Web literature in September when a friend recommended a popular novel. After finishing the free chapters, she decided to pay to read rather than wait a couple of days for a pirate printed version. "I love following a serialized novel and reading the updates every day. It's more fun and pleasant than reading a piece of work that's already finished." User payment isn't the only way Web literature sites profit. Advertising and copyright sales play bigger roles. Shanda Literature has many novels, such as Summer's Desire, My Belle Boss and Legend of Immortal, that were successfully adapted to TV series and online games. "We have made huge progress in transforming Web novels into books, games and TV series," said Lin Hua, Shanda's vice-director general. "Good Web novels can fill the lack of original screen stories. 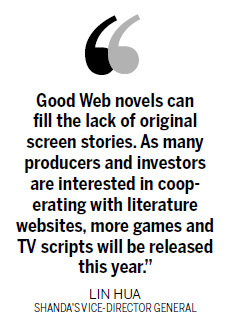 As many producers and investors are interested in cooperating with literature websites, more games and TV scripts will be released this year." Other Web literature companies are also exploring the possibility of turning their popular works into animations and videos. Zongheng.com has been making animation based on Tales of Tarsylia, a well-received fantasy comic strip, since it formed a visual team in April 2010. Those familiar with the industry believe that the real "pay to read" age of Web literature is yet to come, as the mobile Internet is still booming. By December, mobile Web users in China had reached 303 million, increasing 69.3 million year-on-year. They accounted for 66.2 percent of all Web users, said the CINIC report. With 124.5 million people using mobile phones to read novels online, the phones have become the second most popular equipment used to access Web literature. Personal computers rank first. E-readers are also gaining popularity among consumers. More than 1 million e-readers were sold in China last year and sales are expected to reach 1.46 million this year, according to Enfodesk, a business information service provider for new media. In July 2010, Shanda Literature launched its own e-reader called Bambook, which took 10.29 percent of the e-reader market and ranked second in sales in the fourth quarter. A survey by the information center has found that 45 percent of e-reader users are willing to pay for Web literature. "Mobile media users are getting used to paying for various applications, so they have a much stronger will to pay for Web novels than PC readers, who have no such habit," said Zhang, the Zongheng.com executive. Daily PC page views of Zongheng.com run 1.6 million to 2 million, but its mobile Internet site, which was launched just three months ago, has attracted more than 1 million page views a day. "An increasing number of users have access to our Web novels on telecom platforms and they can choose various packages, including pay by month and pay by words," said Wang Haiying, assistant director of Shanda Literature's wireless department, who has been cooperating with the Top 3 telecom operators in China. Mobile reading applications are bringing a fortune to telecom operators. China Mobile is expected to make more than 1 billion yuan this year from the mobile reading service alone. As one of the biggest revenue sources of the mobile Internet, mobile reading made about 3 billion yuan last year, according to Analysys International, a provider of information service and solutions to the Chinese Internet market. Experts predict the revenues will keep going up this year. "With the development of mobile terminals and the decrease of costs on wireless Internet, reading online via mobiles will become mainstream," said Wang Jingjie, analyst at CINIC. Other than helping spread the content of Web literature to a larger group of readers via more channels, digital mobile media could also spur changes of the content. "New forms of Web literature are likely to arise as mobile media develop," said Hou, Shanda's CEO. For example, mobile phone literature is popular in Japan, and Web novels there are usually shorter, more concise and faster in pace. 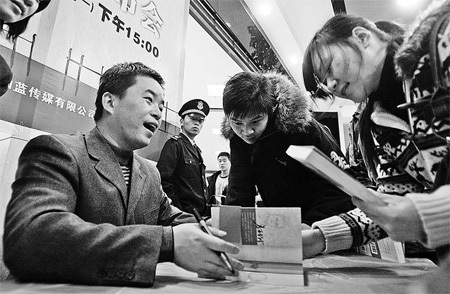 "During the past 10 years, Chinese Web literature has evolved from prose and realistic novels to fantasies and romance novels due to commercial interests," Hou continued. "I wonder what will come next." Su Zhou contributed to this story.